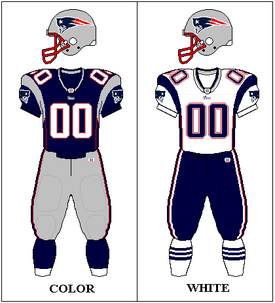 The 2001 New England Patriots season was the 32nd season for the team in the National Football League and 42nd season overall. They finished with an 11–5 record and a division title before advancing to and winning Super Bowl XXXVI. Coming off a fifth-place finish in head coach Bill Belichick's first season in 2000, the Patriots were not expected to fare much better in 2001. In the second game of the season, nine-year starting quarterback Drew Bledsoe, who received a 10-year contract extension in March 2001, was injured on a hit by New York Jets linebacker Mo Lewis, causing backup Tom Brady, a sixth-round draft pick in 2000, to enter the game. The Patriots lost the game to fall to 0–2, but Brady started the final 14 games of the season and compiled an 11–3 record as a starter, helping the Patriots clinch the 2nd seed in the AFC playoffs and a first round bye. As a result, the Patriots became only the 2nd team in NFL history to win the Super Bowl after starting the season 2–3, behind the 1980 Oakland Raiders. With the second seed in the AFC playoffs, the Patriots faced the Oakland Raiders at home following a first-round bye in the final game at Foxboro Stadium; in a snowstorm, a Patriots drive late in the fourth quarter was kept alive in an application of the now-famous tuck rule that was used in overturning a Brady fumble into an incomplete pass. Shortly after, a 45-yard Adam Vinatieri field goal through the snow, considered one of the most clutch field goals in NFL history, sent the game into overtime, when another Vinatieri field goal won it. 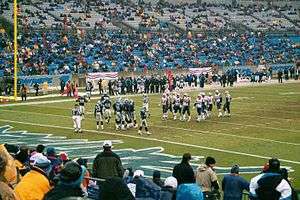 After defeating the top-seeded Pittsburgh Steelers in the AFC Championship Game, the Patriots faced the heavily favored St. Louis Rams, known as "The Greatest Show on Turf", in Super Bowl XXXVI. Once again, Vinatieri kicked a game-winning field goal; the 48-yard kick sailed through the uprights as time expired, and gave the Patriots their first ever Super Bowl victory in what has been considered by many to be a "cinderella" season. As it would turn out the 2001 season served as a launching pad for the team. They would fail to win their division just twice in the next 15 seasons, winning 3 additional Super Bowl titles and an undefeated regular season (followed by a 2–1 playoff record) in 2007. * Rehbein died on August 6. The season got off to a discouraging start as the Patriots visited Paul Brown Stadium and were beaten by the Bengals 23-17, surrendering 361 yards of offense, 104 of them on the ground by Corey Dillon. 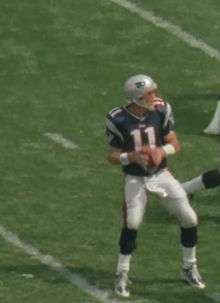 Drew Bledsoe failed to complete a pass in the game's final two minutes; he also failed earlier in the game on a quarterback sneak on fourth down. This was the first game played by any team since the September 11 attacks. During the fourth quarter of a 10–3 loss to the Jets, Drew Bledsoe was hit hard while running to the sidelines by Jets linebacker Mo Lewis. The injury to his chest, which filled with blood, left Bledsoe hospitalized. Tom Brady finished the game, completing five of ten passes for 46 yards, and was elevated to starter for the following week. The 2–0 Colts were crushed 44–13 following a brutal hit on receiver Jerome Pathon by Patriots linebacker Bryan Cox in the first quarter. From there Colts receivers shied away from contact with Patriot defenders and Peyton Manning's interception at the Patriots 22-yard line late in the first half was returned by Otis Smith for a touchdown. The Patriots led 23–0 late in the third quarter before Manning ran in a ten-yard score, then in the fourth the Colts collapsed entirely, surrendering 21 points (including a 23-yard Ty Law interception return touchdown) while managing just a touchdown to future Patriot Marcus Pollard. Tom Brady threw for 168 yards in his first start. This was the first matchup of the storied Tom Brady–Peyton Manning rivalry. Former Patriot Shawn Jefferson caught a 19-yard touchdown from Chris Chandler, but Chandler was sacked six times and knocked out of the game; rookie Michael Vick threw for 56 yards and rushed for 50 more but was sacked three times. The most bizarre score of the game came in the third as a Tom Brady pass for David Patten was deflected off a body and caught at the 30-yard line by Troy Brown for a 44-yard touchdown; Belichick and Brown compared the play to The Immaculate Reception. The Patriots won 24–10. The Patriots squandered a goalline opportunity when they fumbled to the Rams late in the second quarter; the Rams drove downfield and scored. The Patriots' defense was unable to stop Kurt Warner and get the ball back late in the game, as the Rams salted away a 24–17 win. The win proved costly, as five Rams starters were knocked out of the game, and coach Mike Martz said afterward that the Patriots were a Super Bowl-caliber team. Oddly enough this was the last loss for the Patriots during the 2001 season. The Jets bullied the Patriots en route to a 13–0 halftime lead, but the Patriots stormed back, scoring 14 third-quarter points en route to a 17–16 win. During the game the Jets appeared to lose a fumble to the Patriots, but the fumble was reversed based on a rule that would become controversial in the subsequent playoffs – the Tuck Rule. Field goals ruled the day as Shayne Graham and Adam Vinatieri kicked seven combined in a 12–9 overtime Patriots win. The most controversial play came in overtime when David Patten caught a pass and was knocked out of bounds; the ball bounced off his feet and was recovered by the Bills, but the play went to review and referee Mike Carey determined that Patten, momentarily unconscious, had his head out of bounds when the ball touched his feet; by rule the ball was dead. The Patriots thus retained possession enough for the game-winning 23-yard field goal. The Patriots defeated the Dolphins (20–13) for the first time since November 23, 1998 in the final regular season game for Foxboro Stadium. During halftime Patriot greats of the past and present were paraded with each commemorating a season of the stadium's 31-season existence – John Hannah represented 1973 (the year he was drafted by New England), Steve Grogan represented 1976 (the year of the infamous "Ben Dreith game" against Oakland), Drew Bledsoe represented 1996 (the Super Bowl XXXI season), and so forth. During the game itself Tom Brady caught a 23-yard pass from Kevin Faulk and threw for 109 yards himself, as the Patriots raced out to an early lead and held off a late Dolphins rally to earn sole 1st place in the AFC East. The game, the final one in the history of Foxboro Stadium, played in a heavy snowfall, will be remembered for a call near the end of the game, in which the referees initially ruled that New England quarterback Tom Brady had fumbled on a pass attempt, with Oakland protecting a three-point lead. Invoking the "tuck rule", where a ball is ruled an incomplete pass after the quarterback starts any forward motion, the referee overturned the decision after reviewing the instant replay, calling the drop an incomplete pass rather than a fumble. In the fourth quarter, Brady led the Patriots on a 10-play, 67-yard drive, completing 9 consecutive passes for 61 yards and finishing it with a 6-yard touchdown run. Later in the quarter, the infamous "tuck" incident occurred. As Brady dropped back to pass, he lost the ball while being tackled by former college teammate Charles Woodson, and Oakland linebacker Greg Biekert recovered it with 1:47 left. However, an instant replay challenge caused referee Walt Coleman to overturn the fumble, ruling Brady's arm had been moving forward while being tackled and making the play an incomplete pass. Taking advantage of his second chance, Brady led the Patriots inside the Raiders' 30-yard line where Vinatieri made a 45-yard field goal with 27 seconds left, a dramatic kick through heavy snowfall that barely cleared the crossbar, sending the game into overtime. The Steelers struck back with quarterback Kordell Stewart completing a 24-yard pass to Hines Ward and a 19-yard screen pass to Amos Zereoue on an 8-play, 79-yard drive. Jerome Bettis finished it off with a 1-yard touchdown run, cutting the score to 21–10 with 5:11 left in the third quarter. New England was forced to punt after linebacker Jason Gildon sacked Bledsoe on third down, and Troy Edwards returned the punt 28 yards to the Patriots 32-yard line. Five plays later, Zereoue scored with an 11-yard touchdown run, making the score 21–17. With 8:49 left in the second quarter, New England defensive back Ty Law intercepted a pass intended for receiver Isaac Bruce and scored on a 47-yard return to give the Patriots a 7–3 lead. With less than two minutes left in the first half, Warner completed a pass to receiver Ricky Proehl at the Patriots 40-yard line, but New England defensive back Antwan Harris forced a fumble while tackling him, which was recovered by Patriots defensive back Terrell Buckley. New England quarterback Tom Brady would lead a drive that culminated with an 8-yard touchdown pass to receiver David Patten with 31 seconds left in the half to give New England a 14–3 halftime lead. This was the first time in the 2001 season that St. Louis fell behind in a game by more than eight points. The Patriots had no timeouts left for their ensuing drive, which resulted in color commentator John Madden initially suggesting that the Patriots should run out the clock and attempt to win in overtime. Instead, New England attempted to get the winning score in regulation on the final drive. Brady opened the drive with three completions to running back J.R. Redmond, which moved the ball to their 41-yard line with 33 seconds left. After an incomplete pass, Brady completed a clutch 23-yard pass to wide receiver Troy Brown, and followed it up with a 6-yard completion to tight end Jermaine Wiggins to advance to the Rams' 30-yard line. Brady then spiked the ball with seven seconds left, which set up Vinatieri's 48-yard field goal attempt. Vinatieri's game-winning kick was successful, marking the first (and so far, only) time in Super Bowl history that a game was won by a score on the final play. ↑ "SI Scouting Reports 2001". Sports Illustrated. September 3, 2001. Retrieved June 15, 2009. 1 2 Zimmerman, Paul (September 5, 2001). "5: New England Patriots". Sports Illustrated. Retrieved June 6, 2009. ↑ "Mind-blowing stats for Week 5 of the 2013 NFL season". National Football League. October 2, 2013. Retrieved October 3, 2013. ↑ MacMullan, Jackie (February 2, 2004). "Mr. Clutch, no doubt about it". The Boston Globe. Retrieved June 15, 2009. ↑ Thurston, Scott (January 28, 2004). "Taking spirit out of St. Louis". The Boston Globe. Retrieved June 15, 2009. ↑ Longo, Hector (February 1, 2008). "Breaking down the Patriots and Giants". The Eagle-Tribune. Retrieved June 15, 2009. ↑ Draft pick received in a trade from the Detroit Lions for the Patriots' 2001 second-round pick (received with a 2001 fourth-round pick in a trade from the Pittsburgh Steelers for the Patriots' 2001 second-round pick) and 2001 sixth-round pick (received in a trade from the San Francisco 49ers for the Patriots' 2000 seventh-round pick (received in a trade from the Philadelphia Eagles for Dietrich Jells in 1998) in 2000). ↑ Draft pick received in a trade from the San Diego Chargers for the Patriots' 2001 fourth-round pick (received with a 2001 second-round pick in a trade from the Pittsburgh Steelers for the Patriots' 2001 second-round pick) and 2001 fifth-round pick. ↑ Draft pick received with a 2001 seventh-round pick in a trade from the Detroit Lions for the Patriots' 2001 fifth-round pick. ↑ Draft pick received with a 2001 sixth-round pick in a trade from the Detroit Lions for the Patriots' 2001 fifth-round pick (received with a 2002 seventh-round pick from the New York Jets for the Patriots' 2000 first-round pick, 2001 fourth-round pick, and 2001 seventh-round pick in compensation for Bill Belichick in 2000). ↑ "2001 Staff Directory". 2001 New England Patriots Media Guide. New England Patriots. p. 6.